Mary bought the Art Deco-inspired crown from Garrard & Co. herself, and hoped that it would be worn by future queens consort. It is unusual for a British crown due to having eight half-arches instead of the traditional two arches. It is 25 cm (9.8 in) tall and weighs 590 g (1.30 lb). 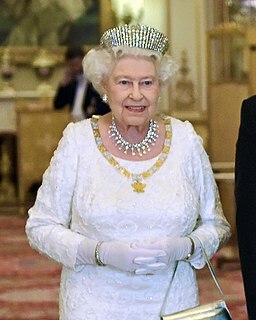 The silver-gilt crown has around 2,200 rose-cut and brilliant-cut diamonds, and originally contained the 105.6-carat (21.12 g) Koh-i-Noor diamond, as well as the 94.4-carat (18.88 g) Cullinan III and 63.6-carat (12.72 g) Cullinan IV. In 1914, they were all replaced with crystal models, and the arches were made detachable so that it could be worn as a circlet or open crown. Mary wore it like this after George V died in 1936. 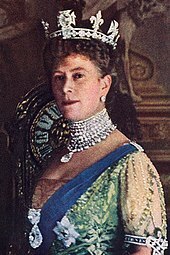 Since Queen Mary died in 1953, the crown has not been worn. It is on display with the other Crown Jewels at the Tower of London. ^ Keay, Anna (2011). The Crown Jewels. Thames & Hudson. p. 175. ISBN 978-0-500-51575-4. ^ a b "Queen Mary's Crown". Royal Collection Trust. Inventory no. 31704. ^ Mears, Kenneth J.; Thurley, Simon; Murphy, Claire (1994). The Crown Jewels. Historic Royal Palaces. p. 27. ASIN B000HHY1ZQ. ^ Twining, Edward Francis (1960). A History of the Crown Jewels of Europe. B. T. Batsford. p. 167. ASIN B00283LZA6. 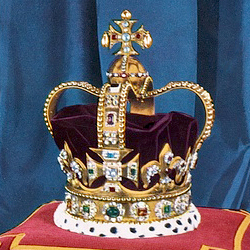 "Queen Mary's Crown". Royal Collection Trust. Inventory no. 31704. 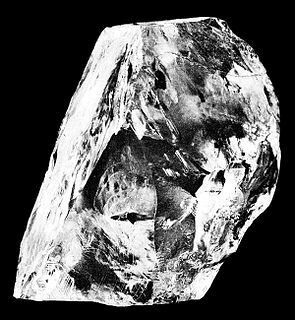 The Koh-i-Noor, also spelt Kohinoor and Koh-i-Nur, is one of the largest cut diamonds in the world, weighing 105.6 carats (21.12 g), and part of the British Crown Jewels. The Imperial Crown of India is the crown used by King George V in his capacity as Emperor of India at the Delhi Durbar of 1911. The Black Prince's Ruby is a large, irregular cabochon red spinel weighing 170 carats (34 g) set in the cross pattée above the Cullinan II diamond at the front of the Imperial State Crown of England. The spinel is one of the oldest parts of the Crown Jewels of the United Kingdom, with a history dating back to the middle of the 14th century. It has been in the possession of England's rulers since it was given in 1367 to its namesake, Edward of Woodstock. Garrard & Co. Limited, formerly Asprey & Garrard Limited, designs and manufactures luxury jewellery and silver. George Wickes founded Garrard in London in 1735 and the brand is headquartered at Albemarle Street in Mayfair, London. Garrard also has a presence in a number of other locations globally. 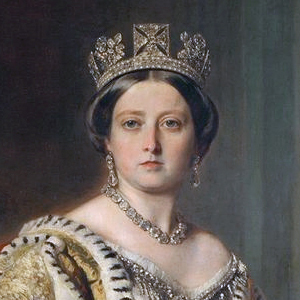 Garrard was the first official Crown Jeweller of the UK, charged with the upkeep of the British Crown Jewels, from 1843 to 2007, and was responsible for the creation of many tiaras and jewels still worn by the British royal family today. As well as jewellery, Garrard is known for having created some of the world's most illustrious sporting trophies, including the Americas Cup, the ICC Cricket World Cup Trophy and a number of trophies for Royal Ascot in its role as Official Trophies and Silverware Supplier, which originally dates back to the first Gold Cup in 1842. The Stuart Sapphire is a blue sapphire that forms part of the British Crown Jewels.